We are continuing on this week with a look at some great photographs from our company archives. This one shows the far end of the press room around 1931. I found this picture hanging in our company lunch room a few years ago. There is a lot going on. 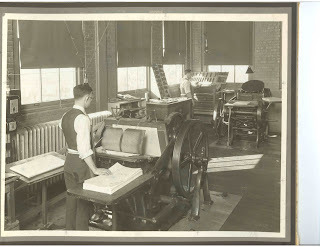 In the foreground a man in an apron, collared shirt, and vest feeds paper into a heavy steel Thompson-Laureate style platen press. A curved stand supports a large flywheel on the right side of the press. You can clearly see the braille embossing plates held open by the jaws of the press. Believe it or not, you can watch a press like this one operating on a tour of APH today. We use two of them pretty regularly for special jobs, although most modern output comes from digital presses. Notice that there are no guards or fences to protect the operator. (Worker safety was only starting to be a national priority and there were few laws to govern it.) The bare leather belt on the left is connected to an electric motor that is out of sight. A naked electric bulb is hanging down from a wire near his head to provide light on cloudy days, but the sunlight streaming through the large windows suggest that was not necessary this day. The bulb’s wire was rigged on pulleys so you could pull it closer if you needed it. This is the western side of the second floor of the 1923 annex. It is where our museum is housed today. In the background, another worker stands in front of a type case setting printer’s type. The cases held drawers whose compartments helped organize the thousands of pieces of tiny lead type used to “set up” print publications. To the right of the type case is a Chandler & Price Platen Jobber Printing Press. It would be years before APH began making large print books. Here the C&P is being used to print labels, product catalogs, and to “foil stamp” book titles on book covers. A few years after this picture was taken, we’d be using a C&P to print record labels for Talking Books. 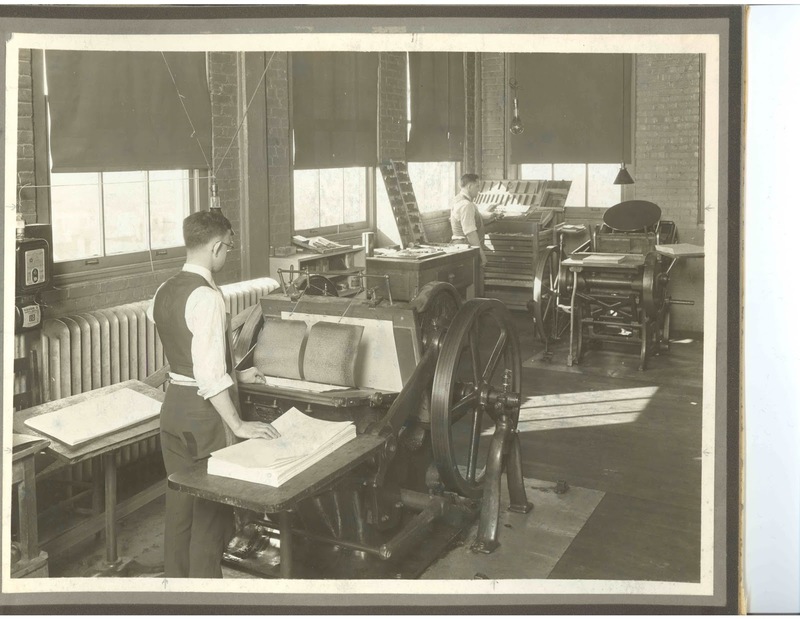 If you’d like to learn more about the history of our embossing and ink-printing presses, we have several pages on our website.